Launch day supply of Apple's iPhone X was exhausted mere minutes after the handset went up for sale early Friday, with rabid demand driving delivery estimates out 4 to 5 weeks for all models, on all carriers. 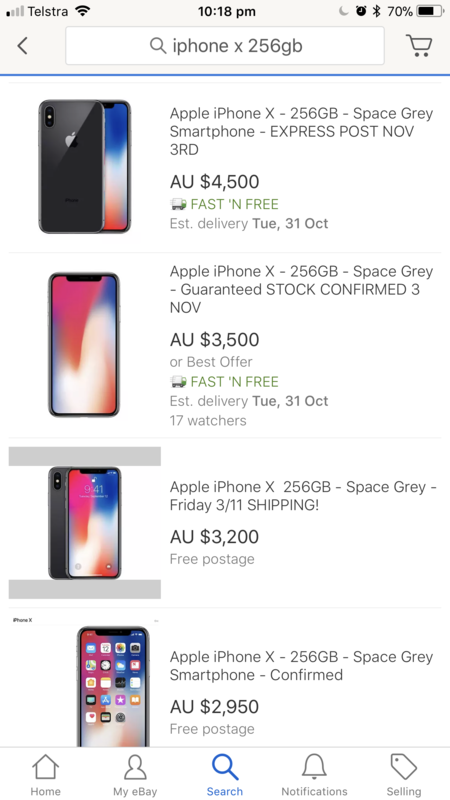 Apple's flagship smartphone went up for sale just after 12:01 a.m. Pacific on Friday, though only a lucky few were able to snag a copy before ship times began to slip beyond the scheduled Nov. 3 launch date. As of 12:11 a.m., Apple's online store pegged shipments for most models at 2 to 3 weeks, an estimate that quickly rose to 4 to 5 weeks less than an hour later. As of 1:45 a.m. Pacific, shipping estimates stand at 5 to 6 weeks. Prior to Friday's start to preorders, analysts warned stock on hand would be scarce. KGI's Ming-Chi Kuo, for example, said Apple will likely take receipt of a paltry 2 to 3 million units prior to the November debut. That number is dwarfed by first weekend sales of iPhone 6 -- arguably Apple's last "big" iPhone release -- which stood at more than 10 million units. A number of reports leading up to Friday's preorder round noted constrained supply of key iPhone X components. Initially, Apple was seeing low OLED display yields, but those problems were supposedly rectified this summer. Later, rumors fingered the TrueDepth camera as a bottleneck. The advanced depth-sensing camera system requires parts that only a select few manufacturers can provide. In particular, suppliers were supposedly having trouble producing TrueDepth's "Romeo" element, or the transmission module that includes a dot projector and flood illuminator. Romeo works in tandem with a "Juliet" reception module consisting of sensing elements like infrared and full-color HD cameras. Kuo believes flexible circuit boards are to blame for the holdup. Most constrained is supply of iPhone X antenna FPCBs made by Murata and Career Tech, with wide-angle camera module FPCBs coming in second. Echoing reports from other outlets, Kuo said dot projectors are also in short supply. The analyst expects 25 to 30 million iPhone X units to ship in the fourth quarter, while the Nikkei Asian Review expects only 20 million to ship by the end of 2017. Whatever the final tally, it is clear initial demand for iPhone X is far outstripping Apple's stockpile. The company and its suppliers are working to solve production issues, with Kuo estimating a rapid increase in availability starting in early 2018. For many customers eager to get their hands on Cupertino's latest gadget, that time can't come soon enough. When I placed my order here in Germany it showed a ship date of November 3. But the conformation email states 2-3 weeks. 4-5 weeks for me. A great Christmas present to myself. Mine got pushed 3-4 weeks too. I feel so disappointed that I'm seriously considering cancelling my order and don't buy it at all. Everyone since all the rumors pointed to severely constrained supply and the launch is in like 55 countries. Having recently switched from AT&T to T-mobile, I ordered from the T-mobile website as I wanted their interest free installment payments and also their trade in promotion. The first 10-15 minutes were awful. All sorts of hangs and 'OOPS we're sorry' messages. Then it started to mostly go through but the iPhone X would never show as an 'upgrade' option. Just the 8 and 7 series. I kept trying and about 80 minutes after start the iPhone X showed up in the list. I placed an order for a silver 256gb for the wife and they claimed it would ship 11/02--11/03. We'll see. I don't believe it. 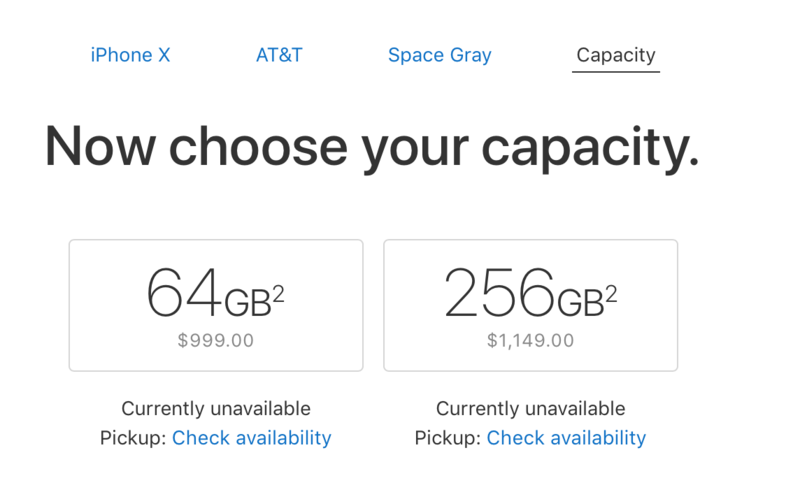 Incidentally I checked the Apple Store around 20 minutes past start and the T-mobile silver 256gb iPhone X was listed at 2-3 weeks estimate, which surprised me as I expected 1-2 months by then. Huh, the T-Mobile app gave me estimated ship date of 11/3-11/10 when I ordered about 15 mins ago at like 2:20am (was gonna do it at midnight, then got sidetracked We'll see. Didn't do the trade-in as I would expect I can get a better value on Swappa or whatever. No idea what they'd give for a pretty good condition 6 but assume it'd be less. Just checked and another batch was released for November 3rd pickup at all local stores for the 256GB. Ordered successfully at 230am. Keep checking it seems. When I pre-ordered my first Apple Watch in April 2015, I was given a June delivery date. I was really annoyed about that, and I too considered canceling the order. On Wednesday the next week, I got a preparing to ship notification, and I had my Apple Watch on the release day, and I did not have to wait until June. I think you should NOT cancel your order. Be patient. What happened for me with my first Apple Watch might happen for you too. ATT is showing "Apple iPhone X will ship between Nov. 02, 2017 - Nov. 10, 2017 Estimated dates not guaranteed. It still says 5-6 weeks on my screen. Oh boo hoo. If you can’t wait three weeks for something you supposedly really want then tough for you.